"Safety is our No. 1 priority," says a Cirque production manager. Like any spectator event, there are two sides to Cirque du Soleil. There's the audience-facing side, with all its daredevil acrobatics and visual spectacle that leaves viewers wide-eyed and slack-jawed. That, unsurprisingly, is the side that gets the most attention. The other, operational side lacks the same exhibitionism and pizzazz, but without it the show quite literally couldn't go on. And in its own way, it's equally impressive. 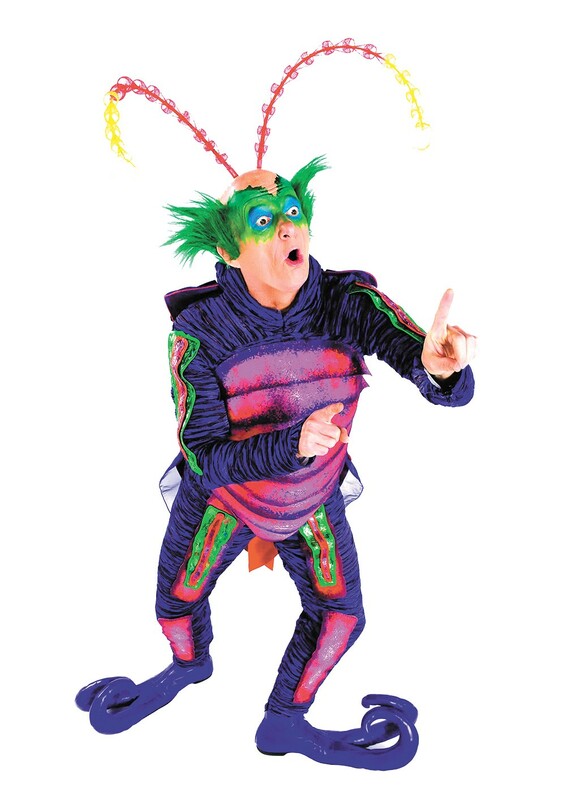 "I think a lot of people don't understand what it takes to put on a production like this," says Michael Naumann, production manager for Cirque du Soleil who's currently on tour with the arena version of the troupe's insect-themed OVO. He rattles off numbers by way of illustration: 19 touring semi-trucks, each 53 feet long, with an additional truck just for catering; 27 technicians; 50 performing artists. Between 60 and 70 local stagehands are hired during setup in every city, with around 100 hired for the closing "load-out" phase. "This particular show weighs about 115,000 pounds. We hang just over 110 motor points in the ceiling, and that's our side masking, speakers, truss, cabling, looms, our wall for our set. We spend about 12 hours setting it up, and it takes just about three hours to take it all down and pack it up in the trucks," Naumann says. When overseas, they swap those trucks for two Boeing 747s. What all those numbers amount to is one of the largest touring shows of its kind. The touring OVO show requires 19 semi-trucks' worth of stuff. "We're pretty unique in the industry. Every once in a while, Marvel is close," he says with the polite magnanimity of someone awarding a participant ribbon. The chirping of crickets suddenly erupts around him as they test for that evening's performance. Hailing from McCall, Idaho, Naumann got his start in this field in 1996 working for Feld Entertainment, which means he's been on the road for the better part of two decades. During that time, he's been with Cirque du Soleil for four tours — Saltimbanco, Dralion, Varekai and now OVO — and has seen close to three times that many of their shows. As a production manager, he's tasked with relocating performance spaces initially conceived for Cirque's 3,000-seat grand chapiteau, or big top, into venues that can potentially seat tens of thousands. "My job is to transform the arena into a theater," he says. "Most of the time, people go into the arena and it's a cold, bright [place] where they go to see hockey games or rock concerts. For us, the show begins as soon as you walk in the arena, so we always try to set the mood with our lighting. On this one, since it's a bug theme, it's actually got crickets, and there's lots of different animal noises when you walk in." That entrance-to-exit experience is vital, Naumann says, because "every Cirque show has that 'wow' factor. You come out and you sit there in your seat, and you're mesmerized for two hours. You watch the acrobats and you're just amazed at what they can do. You don't think about anything else. And when you leave, you're always in a good mood. It's an escape from reality because what [the acrobats] do is not ... reality," he laughs. The acrobatics in Cirque shows are often branded as "death-defying," and that's no hyperbole. In 2013, an experienced acrobat fell 90 feet to her death during a routine KÀ show in Las Vegas, a tragic exception to the troupe's otherwise impeccable performance-related safety record over the course of three decades. Still, even the backstage prep isn't without an element of serious risk. Last November, a crew worker was killed by a telescopic lift while setting up for the San Francisco production of Luzia. With lives hanging in the balance both onstage and off, Naumann and his crew fear nothing more than complacency. "Safety is our No. 1 priority, obviously, with the high level of acrobatics that we do," he says. "Every arena is different, yet we always try to create the same environment, especially for the artists, just so that they have a consistent environment and training area and warmup area. We have four acrobatic riggers on this show and two automation technicians. As part of their load-in and as they build everything, they're constantly doing safety inspections. And then the next morning they come in and they run through everything again. There's a lot of redundancy." The crew generally starts work at 6:30 on the morning before the show and works up until midnight, culminating with perfecting the lighting. The next day, the acrobats are already rehearsing their routines as early as noon for an evening performance. But even with all this preparation and procedure, Naumann says that the cast and crew are as alert and attentive to each performance as they are to the very first.